Profile of the graduate’s competences. Scope to be covered by graduates. Official registration of the program that must contain the authorization code issued by either the Ministry of Education (Secretaría de Educación Pública – SEP) or the General Directorate of Professions (Dirección General de Profesiones – DGP). Once the zero sheet is completed, CACEI will send an email to the Institution confirming that the information is correct. Cost of the accreditation process. Bank details for the payment of the accreditation service. Current reference framework for evaluation. The educational program will receive a second e-mail in which notifying the Control Number of the evaluation process assigned to the program. This email is necessary to request the User ID and Password to access the Integrated System for the Accreditation Management (Sistema Integral para la Gestión de la Acreditación – SIGA). If the program’s data are incorrect the Institution should send an email to erika.romano@cacei.org.mx with the correct data to avoid mistakes in the documents that will be generated during the process. The educational program will review and sign the Service Agreement and will pay the fee indicated in the letter previously sent by CACEI. User ID and Password will be released upon completion of payment and reception of the Service Agreement signed. CACEI will email the Responsible for the Process (declared in the Zero Sheet) the User ID and Password to access the SIGA system. The educational program, through the SIGA system, will capture their responses to each electronic questionnaire and attach all the evidence requested on the Reference Framework (MR-2018). For this step, it is suggested to access the User Manual for the completion of the self-assessment (Manual del Usuario para el Llenado de la Autoevaluación) at http://cacei.com.mx/docs/man_auto.pdf. Once completed this task, the educational program will send the Self-Evaluation report through the SIGA system. CACEI will send an email confirming reception of this report. The educational program should propose to CACEI three dates for the assessment visit, considering at least 45 calendar days after delivery of the proposal. The visit has a duration of two full days. It is suggested that the visits be realized on Monday and Tuesday or Thursday and Friday. The visit must be conducted during regular operation days of the program, not during holiday, vacations or exam periods. The Technical Commission of Specialty appoints the Evaluation Committee (Visiting Team, formed by three members) according to CACEI’s accreditation norms. CACEI shall notify the educational program which of the three proposals was accepted to carry out the assessment visit and will send the Self-Evaluation report to the evaluators who form the Evaluation Committee (Visiting Team) that will conduct the site visit. The educational program must analyze and adjust the Schedule, if necessary, jointly with the Evaluation Committee, considering all activities and the times for their realization. The educational program and the Evaluation Committee will attend the visit as previously agreed. The Evaluation Committee will issue three reports: The summary of indicators, the SWOT matrix, and the extensive overview. The three reports prepared by the Evaluation Committee will be sent to the corresponding Technical Commission of Specialty for analysis, review, and issuance of the report with their recommendation to the Accreditation Board regarding the program be accredited or not accredited. The Technical Commissions of Specialty meets, at least, three times a year to attend their duties. The Accreditation Committee (Accreditation Board), as the higher decision body in CACEI’s evaluation processes, will review and analyze the Self-Evaluation report submitted by the educational program, the recommendations from the Evaluation Committee (Visiting Team) and the proposal of the Technical Commissions of Specilty to issue a decision on all educational programs evaluated by CACEI. An Appeal may be requested by any program that was not accredited. The educational program must deliver a report to CACEI pointing out which are the arguments and the evidence by which it considered that the program meets the established standards in the indicators. 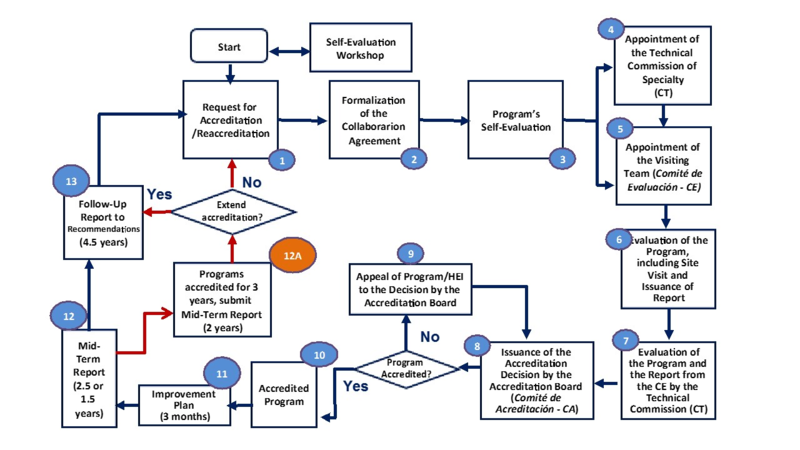 If the program is accredited the process continues on step 10, otherwise the program must start the process again. Programs accredited will be issued a Certified Diploma stating the period of accreditation for the program. Moreover, CACEI will notify COPAES in writing to include these programs in COPAES’ database. All programs accredited must deliver within a 3-month period an action plan (continual improvement plan) to address the recommendations issued by the Accreditation Committee. The improvement plan must be sent to CACEI for review and validation. Accredited programs must deliver a Mid-Term report to CACEI. Programs accredited for five years must submit their report no later than 2.5 years. Programs accredited for three years shall provide their report within a 1.5 year period. The report should point out and demonstrate progress on the actions proposed to address improvements to the program. The report must be sent to CACEI for review and validation. 12A. Programs accredited for three years must submit, within a period not exceeding two years, a Mid-Term report proving that the recommendations issued by the Accreditation Committee have been fulfilled. This report must be sent to CACEI for review and validation by the Accreditation Committee, which will decide whether or not the program meets the standards established in CACEI’s Reference Framework (MR-2018). All accredited programs wishing to be re-evaluated at the end of the term of accreditation shall deliver to CACEI a report of compliance with the recommendations received in the Certificate of Accreditation. In this report should be included the actions carried out for the implementation and fulfillment of the recommendations.